C’est la vie ! | Oh Look! It's A Blog! 11.5.14 – No Drama Llamas! More stuff today from the Xiasumi School Festival. I wanted to do something cutesy since yesterday’s post was kinda creepy themed. The llamas are meant to be worn/attached and they follow you around and walk with you, however I rezzed/resized them for my photo to do something a bit different. You can find them at the Xiasumi School Festival along with pretty much everything else shown. The Seasons Story is a new event that opens tomorrow for the very first time. I love events that are landscaped nicely and this event is set in a forest theme with the vendors being set up on giant books – so cute! Also, I am so happy summer is over. My photos today are all fall themed and fall is my favorite season, so I had fun with these photos. My hair is new from D!va and will be available at The Seasons Story tomorrow. This hair is pretty unique as the leaves you see can be turned off or changed to fit the season. There is also an option to add fruit to the leaves such as grapes, or turn the leaves off entirely. I thought the leaves suited these photos so I left them on with one of the autumn texture options. 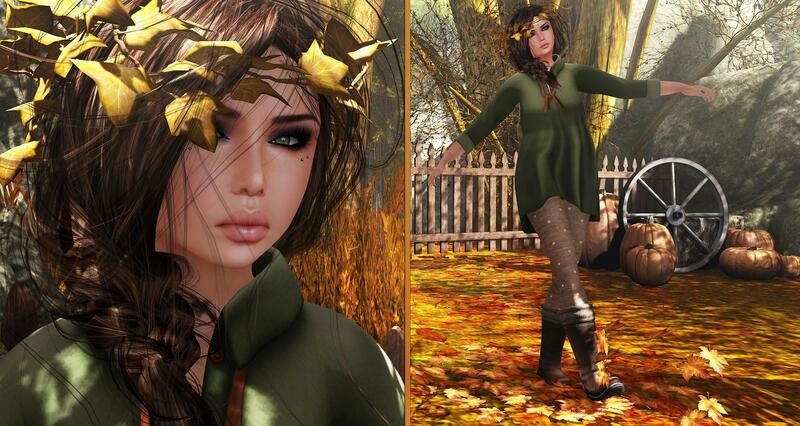 My dress and boots are also going to be available at The Seasons Story and I really love these boots. You can change the sock texture between 4 different options, and the boots themselves are available in several color choices.